A late collapse sent the Club de Soccer Mont-Royal Outremont Griffons home with just one point on Sunday night. 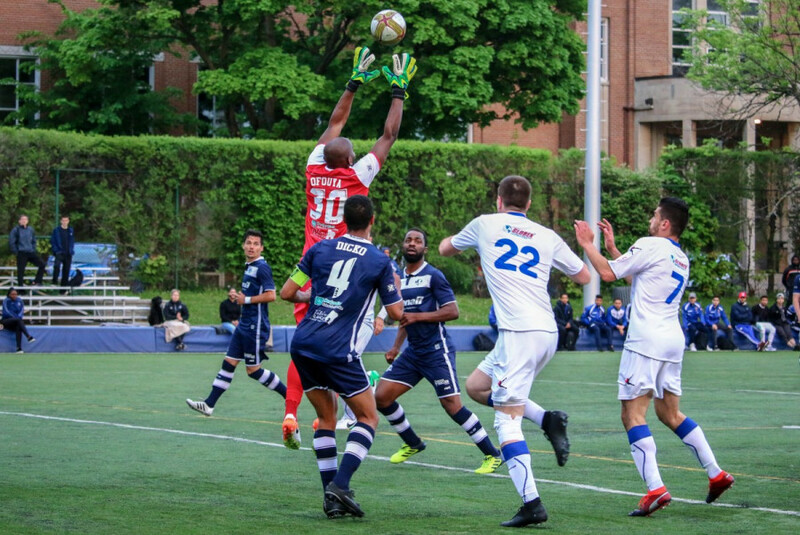 After receiving two red cards and down to nine players in the second half, Club de Soccer Longueuil managed to steal a point from the home team in a 1-1 draw. The Griffons started the game with tenacity. The first 45 minutes saw the midfield quartet of Sean Rosa, Billal Qsiyer, Kenzi Belguendouz and Renan Dias dominate possession, playing fast paced soccer and exposing Longueuil’s defensive vulnerability. The home side’s counter attacking display disrupted Longueuil for the majority of the first half, with Griffons captain Rosa at the heart of their offensive push. The captain’s quick feet, energetic display and eye for key passes saw CS MRO beginning to unlock Longueuil’s defence. All that was missing from the Griffons’ efforts was a goal. With the first half coming to a close, forward Ritch-Andy Jean-Pierre would eventually find himself in Longueuil’s box. A side-footed finish into the left corner put the Griffons up 1-0. As the Griffons put themselves in the lead, they were eventually faced with bad news on the other side of the field. At the beginning of the second half, Griffons would be forced to substitute defender Stephen Meterissian after a head collision in the first. According to head coach Luc Brutus, Meterissian will be rested for the next couple of weeks after sustaining a concussion on the play. Longueuil managed to shift the momentum in their favour, and just as the Griffons put the the pressure on them in the first, they did the same to their opponents in the second. Possession was in favour of the visitors, but couldn’t muster up a goal to show for it. The second half would eventually see a dramatic turn for Longueuil. Pierre Lamothe and Vincent Bourbonnais would be sent off after receiving two red cards within ten minutes of each other. With nine players on the field and down a goal, Griffons looked set to bag a crucial three points at home, but a shocking turn of events would see otherwise. At the 92nd minute, Longueuil’s Philippe Davies would surprise everyone after scoring a free-kick to level the score at 1-1. The ball crossed the line after what should have been an easy save for Griffons goalie Gabard Fenelon. The Griffons now sit five points out of first place, held by Association de Soccer de Blainville, and one point ahead of FC Gatineau in the Première Ligue de soccer du Québec standing. CS MRO will pay visit to PLSQ newcomers, Club de Soccer Fabrose in Laval next Saturday.